Rumours of Soldiers of Fortune: Interview with Stephen J. Cannell, The Great 80’s TV Flashback. Michael O'Herlihy, Dennis Donnelly, Craig R. Baxley, David Hemmings, Tony Mordente, Arnold Laven, Christian I. Nyby II, Ron Satlof, Sidney Hayers, Gilbert M. Shilton, Bruce Kessler, Guy Magar, Bernard McEveety, Chuck Bowman, Rod Holcomb, Ivan Dixon, James Fargo, Michael Vejar, Nicholas Sgarro, Bob Bralver, James Darren, Les Sheldon, John Peter Kousakis. 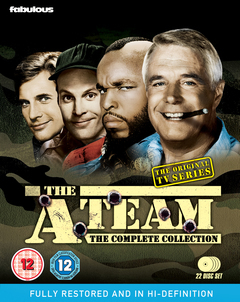 George Peppard, Dwight Schultz, Mr. T, Dirk Benedict.